I have to clarify that the purpose of this post is not to give an advise, but rather to share personal experience and to remind myself how it was. Time flies and what seemed like ages then, seems far away now and things get forgotten. I do have a decent knowledge of nutrition and used to work as a nutrition and supplement adviser at some point in my life, so it was important to me to “make it right”. So I did a lot of research on baby led weaning and baby nutrition before I began. 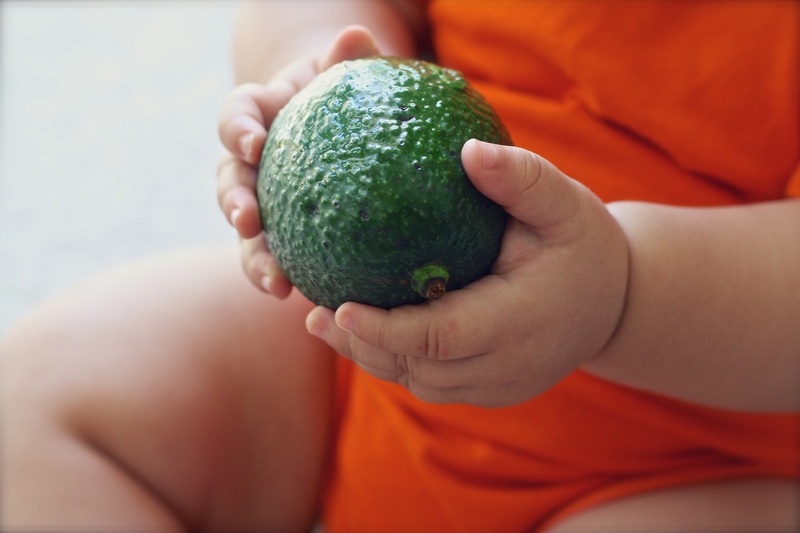 One of the major differences between adult and baby nutrition is in fat. As much as 50% of nutrients for baby must come from fat, which is not a surprise given that mother’s milk is quite fatty. The rest should be a mix of good quality protein and nutrient rich carbohydrates, i. e. vegetables. Baby led weaning was not an intentional choice. Its just my daughter absolutely refused to eat any of nice veggie homemade purees I was making. She’d have none of it. She did enjoy to “gum” various foods through the mesh feeder, so it was only natural for her to get curious about actual food pieces to play with and to try. To prevent choking, all food pieces must always be very soft and small, so that baby can practice to chew and swallow as well as explore new tastes and textures. It is also important to introduce each food item one by one, withing a couple of days from each other, in case of allergic reaction. Unless the food is relatively safe, like broccoli or bananas, which can be introduced on consecutive days. It is also important to continue with breast milk and\or formula until the baby is comfortable eating a variety of foods. If done right, baby led weaning is a lot of fun for both the baby and the parents. hard boiled (but not over-boiled!) egg yolk – excellent first food, because it is full of good fat for baby and a nutritional bomb. watermelon – excellent when cool, for teething. pomegranate seeds – don’t worry about the actual seeds, they are large enough not to go through the mesh. My daughter really enjoyed popping them! peeled apple and pear slices. Everything should be soft enough to turn to mash when baby picks it up. very small pieces of egg whites and hard boiled yolk. very soft or mashed avocado. small pieces of boiled carrots. small pieces of boiled or baked potatoes (white and sweet). boiled, canned or steamed peas. boiled, canned or steamed asparagus tops – make sure to remove the stringy pat of stem. boiled or steamed broccoli – those have a nice stem to hold on to while chewing those tops. soft banana round quarters – i. e. cut each banana round into quarters. small cubes of soft bread without crusts – on its own or smothered with butter, coconut oil or guacamole. boiled ravioli or small pasta shapes in sauce – a very good chance to boost veg intake. Beware of the mess! soft boiled or canned, sliced green beans. At this point smooth nut butters and hummus can also be introduced either on its own, in small scoops to play with or on a piece of bread. Also, small flakes of soft fish, boneless of course. I wanted my daughter to explore the variety of other foods before I introduced her to dairy products. Many children get quite addicted to dairy products, especially things like cheese and yoghurt so they would give it preference over anything else and I wanted her to try all kinds of food before she discovers cheese. We introduced dairy products from age 1.6: organic, pure butter, which she loved and could just eat a stick of butter with her hands, porridge oats made with full fat organic milk, plain Greek yoghurt and cheese slices. From 2 years we introduced raisins, hemp seeds and chia seeds, cooked with porridge and she could eat pecan and walnut halves at 2.6.